The put-in is at a boat ramp at Horseshoe Bend on Chocolate Bayou. If conditions allow, we will kayak 1/2 mile and back on Lost Bay to a lunch beach. 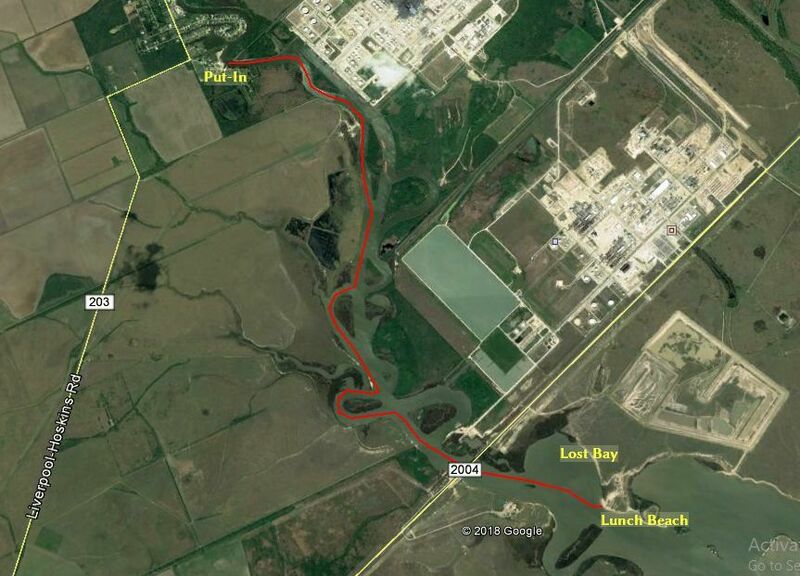 Its a small 1/2 mile wide bay, check it out on Google Earth. The little bar & grill there at the put-in / take-out is closed, but I expect the boat ramp to be operational. There may be a fee so bring a little cash. Directions --Enter 7301 County Rd 203A, Liverpool, TX 77577 in your favorite navigation device. If the destination is not clear, enter Lute's Marina & RV at 6811 County Rd 203, Liverpool, TX 77577, they are just up the road. Hazards -- Cold water, cold air. Dress appropriately. Long range forecast is 42 degrees, warming up to 51. Have a change of dry clothes in a dry bag. We maybe sharing the waterway with outboard motor boats, so anticipate boat wakes.